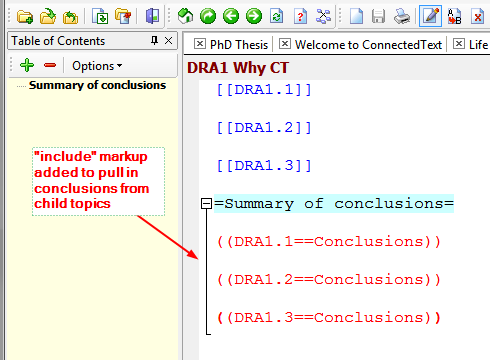 We are nearing the holy grail of this tutorial series, namely the post on how to code qualitative data in ConnectedText as a CAQDAS. However, before we get there, there are a few more things to clarify. 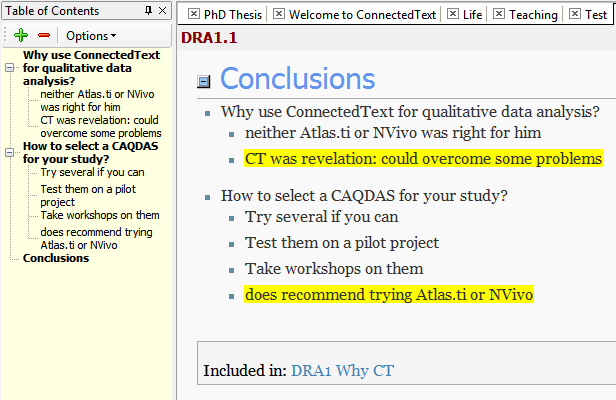 I should add a caveat that those who expect a full replica of the coding functionalities of NVivo or Atlas.ti will be disappointed. CT hasn’t been designed as a dedicated CAQDAS. 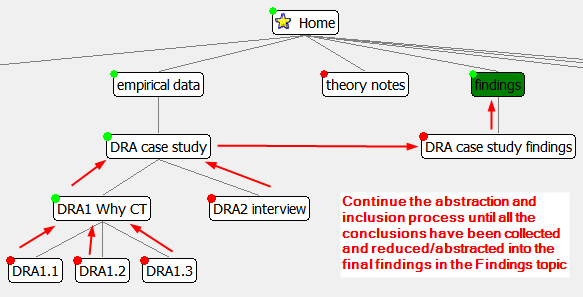 What I’m going to show you here is how you can model a qualitative analysis process in CT that could replace some forms of coding in NVivo or Atlas.ti. I would say that the process I am going to describe is a form of “soft coding,” if by “hard coding” we mean a grounded theory-type implementation of qualitative analysis. 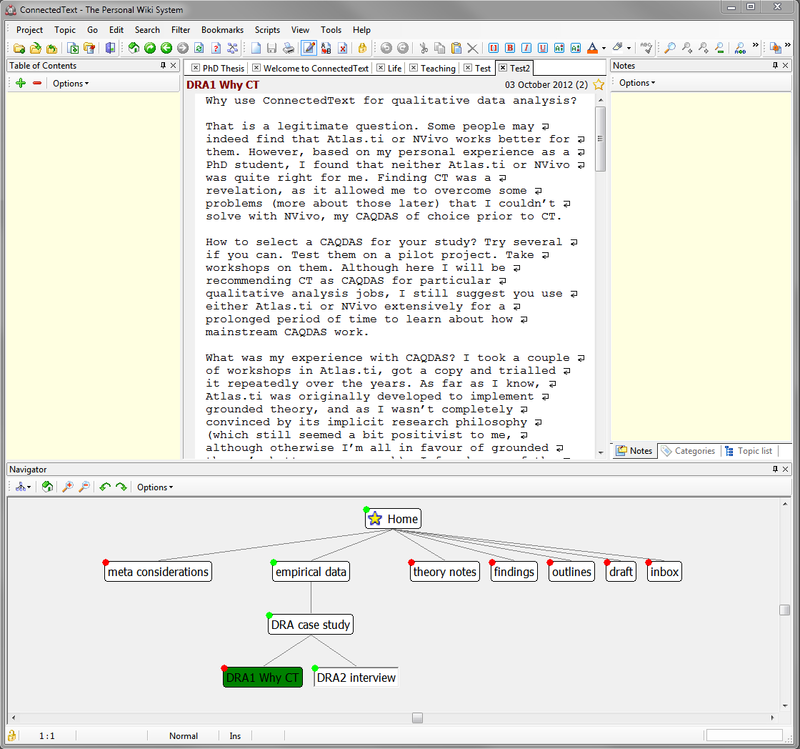 The difference between “soft” and “hard coding” lies in your interpretation of whether qualitative analysis is more of an interpretive art or a scientific process modelled on the natural sciences. 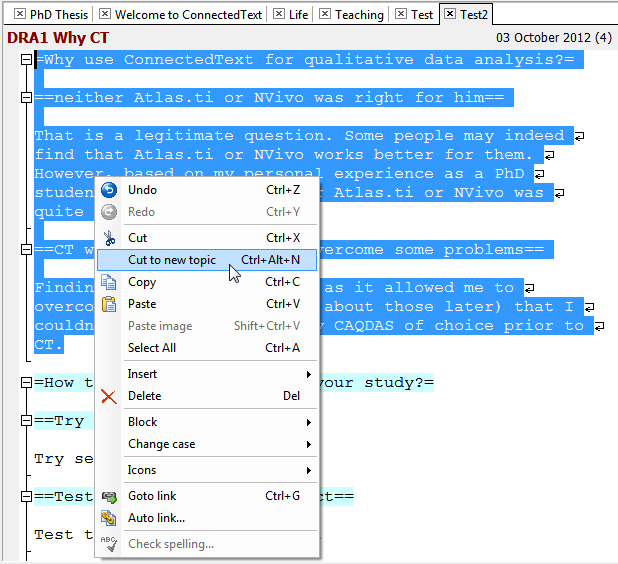 If you want to turn qualitative analysis into a routinised activity in order to adhere to positivist ideals of science, then you are better off with NVivo or Atlas.ti. 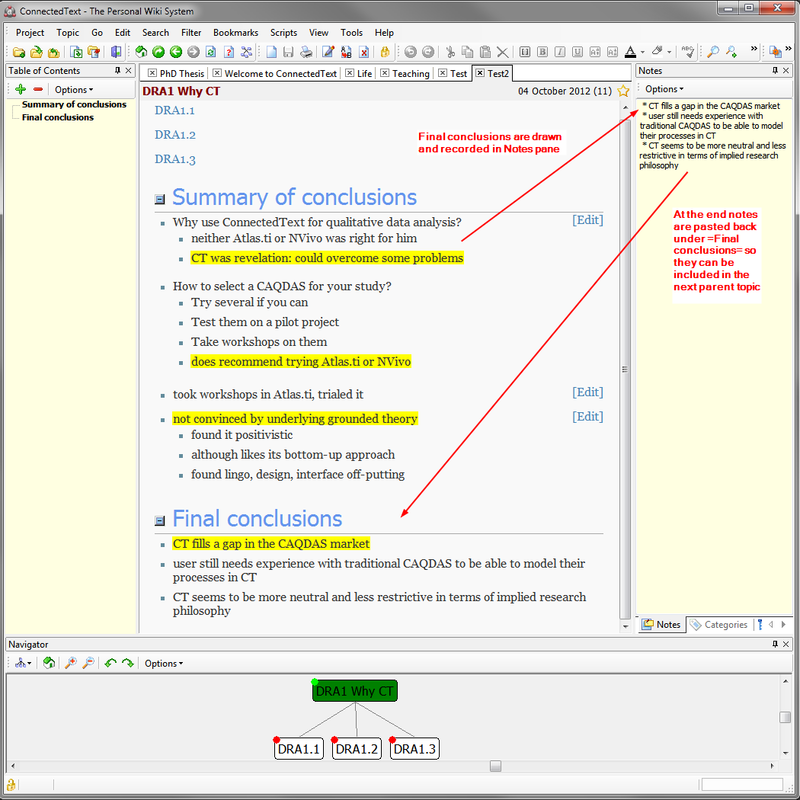 However, if you approach qualitative analysis as more of a poetic, interpretive process where you would like to focus on the development of the emerging meaning rather than on the mechanics and accuracy of coding, then CT might be for you. How does “soft coding” work in CT? 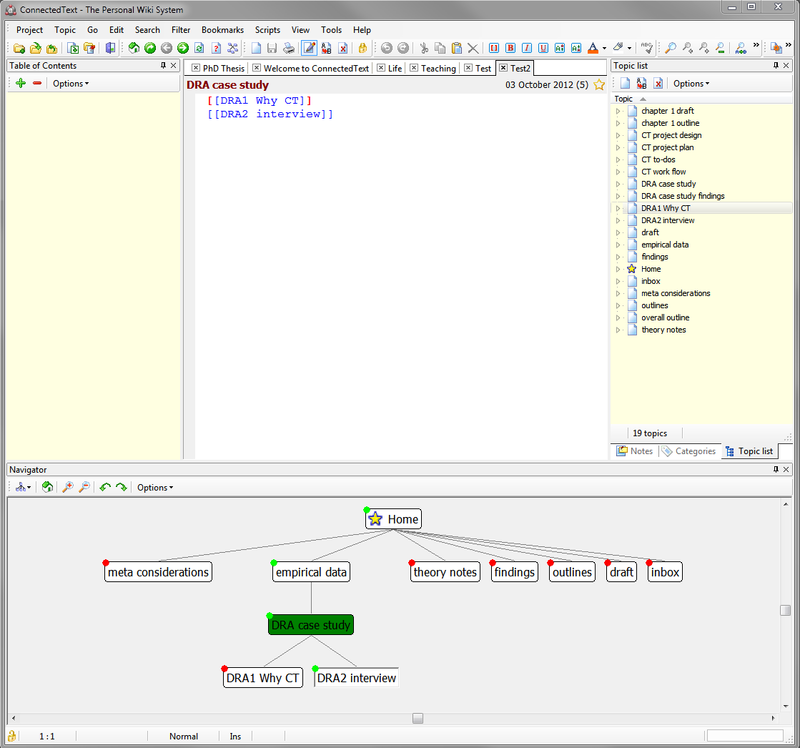 Essentially what you will be doing is annotating (coding) qualitative material; aggregating these codes, and evaluating them all within their “natural habitat:” the document and the case study from which they had emerged, as opposed to let’s say NVivo, where the codes are aggregated by separating them from their documentary and case study context. 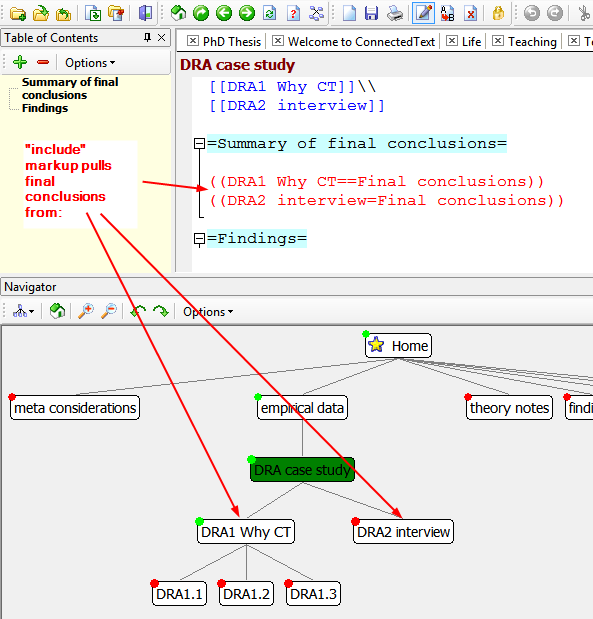 CT instead can allow you to trace the whole trajectory of how an interpretation emerges from the original document and rises through several levels of aggregation and abstraction until it finds its place as a distilled finding in the final draft. What I will describe here is a “reverse cascade” (from bottom to top) of abstraction. We will start out with the empirical data at the bottom rung, and interpretation and meaning will be gradually abstracted through several layers of filtering and reduction, rising to the top like bubbles or cream. 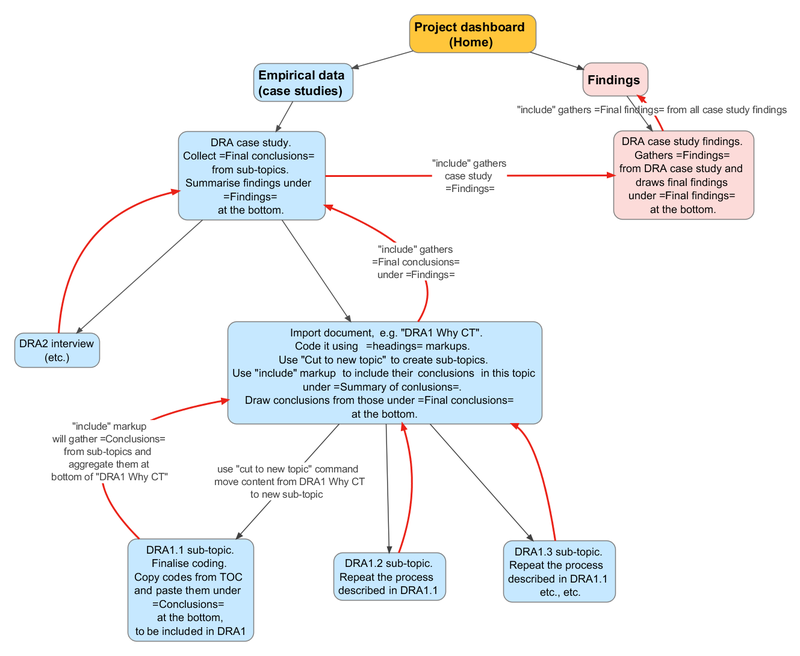 Before I launch into my demonstration and explanation of how “soft coding” works in CT, let me run through a checklist that I recommend you go through if you want to try to model this process in your own copy of ConnectedText. set up your CT desktop layout as suggested here. display the Navigator in a second monitor, if you have one. If not, just open it when needed, or dock it in the right pane. customise your markup colours, as described here. 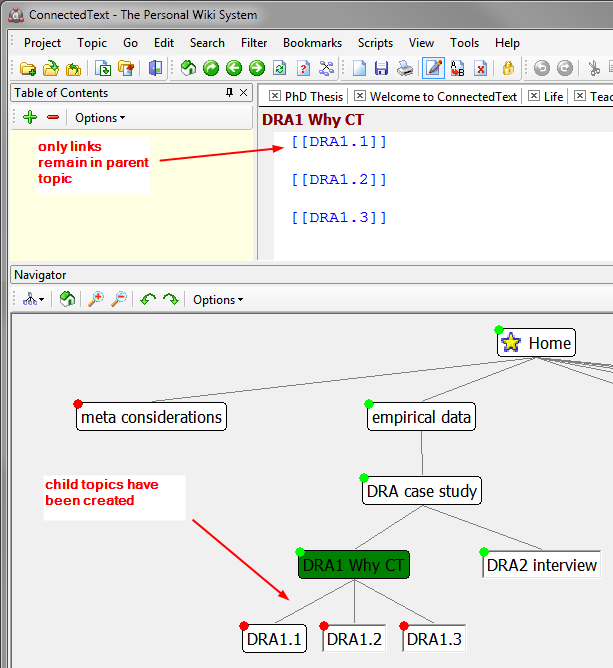 set up your overall CT project design and create the required topics as described here. 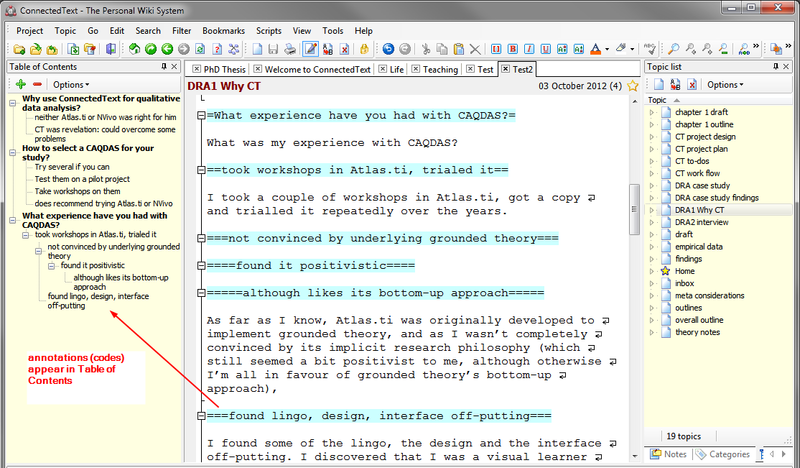 use the “include part of other topics” markup. If you are comfortable with all that, you are ready to be introduced to the coding process flow in my next post.